Pulses are edible seeds of plants in the legume family. Pulses do not include fresh beans and peas, soybeans and peanuts. Fresh beans and peas are related to pulses because they have edible seeds in podded plants, they differ because they have lower amounts of starch, fibre, and protein. Soybeans and peanuts differ because they have a much higher fat content – pulses have virtually no fat. We need cholesterol for good health. There are different types of cholesterol. The bad cholesterol is connected to heart disease. Pulses have a high amount of fibre which helps lower your LDL cholesterol (the bad one). Fibre includes the part of plant foods that your body cannot digest or absorb. Pulses are high in both soluble and insoluble fibre. Soluble and insoluble fibre are important for regulating your blood sugar levels, reducing bad cholesterol, digestion and regularity. Pulses contain slowly digestible carbohydrates which keeps your blood sugar levels closer to normal. Digestible carbohydrates convert to glucose when they are absorbed – glucose is important to energize you, and for the health of your brain and nervous system. Pulses are high in protein. A ½ cup serving of pulses will provide with an average of 10-17 grams of protein. Pulses are higher in the essential amino acid (amino acids we have to get from food) lysine, whereas cereals are higher in the essential amino acids methionine and cysteine. It is ideal to combine pulses with cereals or nuts to get a better quality protein that contains all of the essential amino acids. This is especially important if you are a vegetarian. Pulses are a source of folate, zinc, B vitamins, and phosphorous, amongst other nutrients! Folate is one of the B group vitamins that can be found naturally in foods. Folate is needed to make red blood cells. Zinc is needed for proper growth and helps your body fight infections. Vitamin B6, also known as pyridoxine, is a water-soluble vitamin. It helps to form hemoglobin, which carries oxygen in your blood. Phosphorous is a mineral that is part of every cell in your body. Its main role is in the formation of bones and teeth. 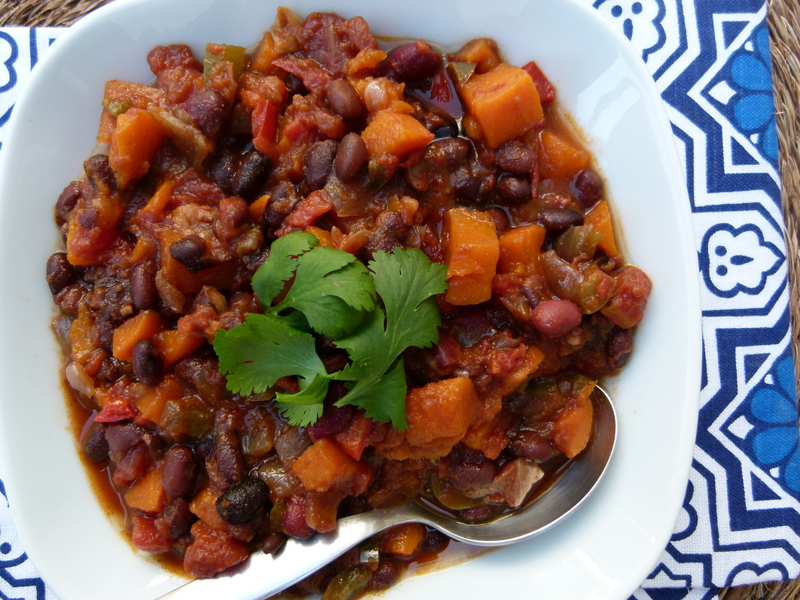 I serve this chili in a bowl or deep plate with rice, quinoa, or a nice crusty bread. You can serve this chili with Monterey Jack cheese, sour cream and/or avocado – I like using avocado for the taste – avocado is also high in monounsaturated fat (heart healthy) and soluble fibre. I like heat in my food – You can add as little or as much heat as you would like – cayenne pepper is great for stimulating your metabolism – an important factor for achieving a healthy body weight. I use other beans/peas/legumes to vary this recipe such as red beans, chickpeas, and navy beans. This recipe freezes well and you can save multiple servings for later.